Rio Grande’s Will Hill throws a pass during the first half of Saturday’s game with Marian University in the 16th Annual Newt Oliver Coaches Classic at the Newt Oliver Arena. Hill scored a career-high 41 points and tied a school record with 10 three-point goals in the RedStorm’s 104-90 win over the Knights. RIO GRANDE, Ohio — As the head coach of the Rio Grande basketball teams led by Bevo Francis in the early 1950s, Newt Oliver got to see more than his fair share of high-scoring performances. Saturday afternoon, in an event named after the legendary sideline boss, another Rio standout put on a scoring clinic of his own. Will Hill poured in a career-high 41 points and tied a school record in the process, leading the RedStorm to an impressive 104-90 triumph over Marian (IN) University in the 16th Annual Newt Oliver Coaches Classic at the Newt Oliver Arena. Rio Grande improved to 4-8 with the win, its second consecutive triumph and third in the last four outings. Marian, a member of the perenially-strong NAIA Division II Crossroads League, slipped to 8-5 with a fourth straight loss. Hill, a senior from Worthington, Ohio, connected on 10 three-point goals to tie the school record previously set by P.J. Rase in a 95-51 win over Virginia Intermont on Nov. 27, 2009. He also tied the NAIA DII single-game high for three-pointers in a game this season. Hill went 12-for-20 from the floor overall, 10-for-15 from beyond the three-point arc and 7-for-8 from the free throw line to surpass his previous career-best mark of 35 points. He also had four rebounds and four assists in the win. Hill has now scored 34 points or more in three of Rio’s last seven outings and currently ranks fourth nationally in free throw shooting (94.2%), ninth in scoring average (22.6 ppg) and 13th in total scoring (271 pts). The RedStorm also got 19 points from senior Kenny Council (Jacksonville, FL) and 18 points from sophomore Stanley Christian (Norfolk, VA) in the winning effort. Both grabbed a team-high six rebounds, as did sophomore Greg Wallace (Montego Bay, Jamaica). Senior Devon Price (Pickerington, OH) narrowly missed a double-double in the victory, tallying nine points and handing out a career-high eight assists. Rio Grande followed up a 50 percent shooting performance in the first half (16-for-32) with a 62.5 percent effort after the intermission (20-for-32) and led from start to finish. 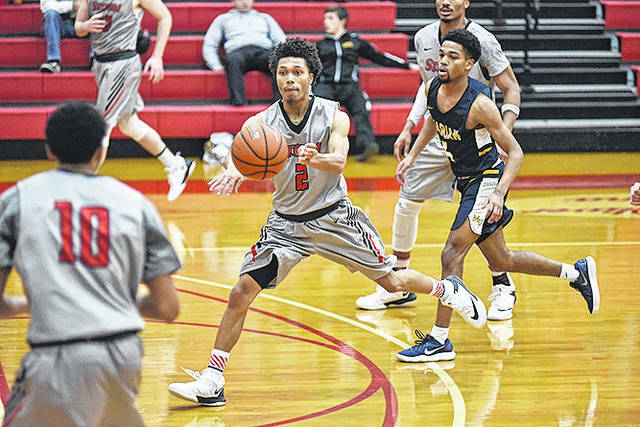 As was the case in a rout of Carlow University one week earlier, the RedStorm got off to a blistering start by scoring the game’s first 14 points. Marian, which shot 50 percent in the first half, 56 percent in the second half and 53 percent for the game, managed to cut the deficit to three points on three occasions in the opening stanza, but never got any closer the rest of the day. The RedStorm enjoyed a seven-point halftime lead and opened the second half on an 11-2 run to take a 61-45 advantage following a three-pointer by Hill with 18:04 left in the game, but the Knights hung tough and drew to within five, 72-67, after a bucket by Wes Stowers with 10:27 remaining. Rio countered with nine of the game’s next 11 points to push its lead back to 12 with 8:02 left and MU failed to get the deficit back into single digits for the remainder of the game. Stowers came up two points short of equaling his own career high, finishing with 32 in a losing cause for the Knights. Mark Albers and Sterling Brown tossed in 18 and 12 points, respectively, while Andrew Jordan narrowly missed a double-double with nine points and a game-high 10 rebounds. Rio Grande returns to action on Tuesday night when No. 6 Indiana University East visits for a River States Conference contest.